VTL believe that a passion for music is a passion for life. Music expresses our being, in all of its individuality. Music creates our sense of "place." This passion for music has brought forth a range of tubed audio components whose aim is to recreate the experience of live music in your home. Your music, your spirit. The essence of VTL is the marriage of music and technology, expressed in elegant design, attention to detail, value, and reliability. Their goal is to make the experience of music and home theater come alive for you. Let us introduce you to the VTL "family" and share the passion. All VTL amplifiers and preamplifiers, whether destined for your first system, your home theater, or the system of your mature, informed tastes, share the "VTL family sound" -- vivid, clear, full, with a deep stage and substantial bass, "open and muscular", as one reviewer expresses it. They are designed to fill your home with the music you love and live by. Music is complex, and VTL seek the musical purity that comes from a simple circuit path built with premium parts. We offer the full frequency response, so you get all the music with few electronic distortions. The preamplifier functions to select the desired source component, and to provide the user with a volume control with which to be able to vary the sound level of the whole system. Preamplifiers are required for amplifying the small source signal sufficiently and providing the instant current to be able to properly drive a power amplifier. The consideration of this component is critical, as it is usually the component to have the greatest effect on the source signal. The VTL Preamplifiers are designed to deliver outstanding performance driving long interconnect cables and low impedance power amplifiers. The VTL preamplifiers offer superior sonic performance, intuitive user interface and many other features. Our preamplifiers are also ideally suited for first-time tube users, as they require little to no maintenance. For devotees of analog/vinyl reproduction, VTL offers two models of phono stages, both offering users flexibility, ease of use, and outstanding sound. The TP-2.5 Series II phono stage represents tremendous value for those looking to assemble a high resolution system at a reasonable cost. The technology used is trickled down from VTL's top phono stage, the Signature TP-6.5. Delivering a large measure of the musicality and resolution of its much more expensive stablemate, the (new for 2013) TP-2.5 II offers dramatic improvements in speed, delicacy, nuance and drive. For analog connoisseurs who demand the absolute best in analog reproduction and who value the flexibility of changing load and gain on the fly, the TP6.5 Signature Phono is the must-have analog component. Power Amplifiers are required for turning the voltage signal into current to drive the loudspeaker. The function and interface of the power amplifier to the loudspeaker is potentially much more complex than that of the preamplifier, as it involves more interaction considerations that change under dynamic conditions. Loudspeakers often change their characteristics with changes in volume and/or frequency, and the matching of the power amplifier to the loudspeaker load is therefore critical. Monoblocks offer ultimate channel separation, and can be placed closer to the loudspeakers for minimal current loss through the loudspeaker cables, and minimal interference between power amplifier and source components. 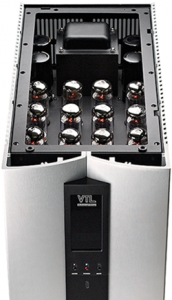 VTL Monoblocks can also be purchased in single units, for use in multi-channel systems. The latest revisions to the VTL monoblock series bring substantial improvements to the technical and musical performance, cementing VTL's position as the world leader in hi-end amplification. Experience the VTL sound to hear for yourself why these amplifiers have won so many 'Best sound of Show' awards, and why you need VTL in your music system. Stereo amplifiers save space, offering two channels of amplification on one chassis. If proper consideration of the power supply is not taken into account the two channels can interact with each other and degrade stereo performance. The VTL Stereo amplifiers have separate power supplies, offering channel separation that rivals that of most monoblocks. The VTL IT-85 integrated amplifier has both a fully active high end preamplifier and power amplifier on one compact chassis. It offers the performance and features of high end separate components, with the space-saving approach of an integrated. If simplicity of operation with high performance sound is key in your system selection criteria, then the VTL IT-85 Integrated Amplifier is the ideal product for you.